Winter driving can be dangerous. A clear and sunny winter day can quickly turn to snowy, blowy and icy conditions on the road. And even on sunny days black ice can lurk on the roadway. Our insurance team wants to help keep you and others safe. 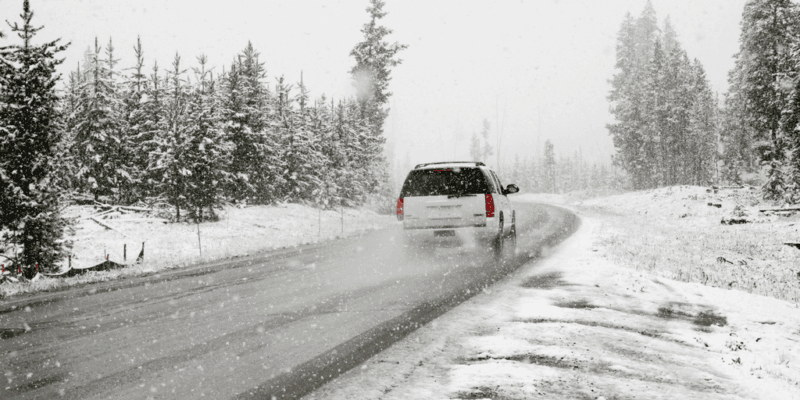 Here are some tips to travel safely on the roads this winter. Check weather conditions often. Be aware of blizzards, heavy snow, freezing rain or drizzle, cold winds, and black ice. Check on your phone or radio for weather updates. Make sure wipers are in good condition and have lots of windshield cleaning fluid. Make sure the fluid is rated for -40C. If you must drive in poor winter weather, be careful, take your time and plan ahead. Make sure you have enough fuel in the tank before you head out. Try to keep the tank full. check that your mirrors, windshield and all windows are cleared of snow and frost before you begin your travels. Clean off the entire car to ensure your car is visible by other drivers. Wear your seatbelt and be sure all passengers are belted in properly. Children need to be in seats that are appropriate for them. let another person know when you are travelling, where you are going and when you expect to get there. avoid passing other vehicles, if possible, when weather and road conditions are poor. If you are stuck on the road in a storm of in a snow drift, try not to panic. Use your cellphone to call for help. Avoid overexerting yourself and over exposing yourself to harsh weather. Shovelling in cold temperatures can be deadly. Stay in your car. Run your motor sparingly. Beware of exhaust fumes and the possibility of carbon monoxide. Ensure the tailpipe is not blocked by snow. Let some air in the car to keep air fresh and clean. Use a candle for heat, instead of the car heater, if possible. Se out a warning light or flares. Exercise your limbs and don’t fall asleep. Keep watch for those coming to help you. Wear a hat to keep you warmer. We lose up to 60% of our body heat through our head. The following are some tips provided by Transport Canada. THe danger of skidding is greatest when you are taken by surprise. Since not all vehicles respond the same way to ice, slippery roads, learn how to handle your vehicle in all types of weather. Read the owner’s manual to learn about your vehicle’s braking system and tire traction. You may also consider taking a winter driving course. In winter weather, avoid using cruise control. Having the latest safety features on new vehicles and/or knowing how to handle your vehicle are good ways to keep control. Electronic Stability Control (ESC) helps drivers avoid crashes. ESC sensors compare the direction of the steering wheel to the direction the vehicle is going. When they are not the same, and the vehicle begins to skid, ESC applies the brakes to one or more wheels, or reduces engine power, or both, to help keep the vehicle under control. ESC is ‘On’ when you start your engine. If your vehicle has an ESC ‘Off’ switch, turn off ESC when you are stuck in deep snow. A dashboard light will remind you to turn it back on. The only way to get ESC is to buy a new or used vehicle that is already equipped with it. If you are thinking about buying a new vehicle, ask your dealer to show you models with ESC. To learn more, visit www.tc.gc.ca/ESC. A good way to avoid skidding is to drive slowly. Give yourself extra time to drive to your destination and be very careful when you brake, change lanes, make turns and take curves. Take care on the roads this winter. Be safe, everyone.